Welcome to a new direction for the “Road to Know Where”. My pursuit of documenting the ongoing nooks & crannies of Microsoft’s Windows and Office has taken a back-seat to my other passion: Musical Improvisation and Jazz Harmony. Thinking “Playing by ear” is a bad thing is wrong! – Most people apologize when admitting they only “play by ear”. As children we learn to speak by imitating the speech we hear (aka “playing by ear”). Later we learn how to read and write our native language. It’d be great if all music students began by “playing by ear” then learned how to read and write music. Similarly to being able to read a book, or write a letter – without learning how to read and write music you are musically illiterate. That sounds harsh, but the musical world opens-up when you learn to read music. It’s also important to express yourself by creating and improvising your own music. Having “perfect pitch” would make me a better musician, yes however… – There’s no question having “perfect pitch” would be immensely helpful. However you should already be “playing by ear” (see previous). You can later be trained to have “relative pitch”. Why do we learn the Circle of 4th and 5th? – Most music students (and some teachers) do not study the technical history of Western Music, or science of sound (aka Acoustics). This is understandable; to become a great Bread Baker you needed know the ancient history of yeast. However, knowing the science behind harmonic overtones and history behind Pythagoras’ Circle of 5th are crucial to truly understanding the construction and movement of chords. Jazz Harmony is different than Traditional Harmony – I hear students say they don’t need traditional harmony, because they’re going to study Jazz/Rock harmony. NO – Our Western Harmony has a 2000+ year old history that evolved alongside the development of our alphabets, languages, religions, calendars, mythology and sciences. Jazz Harmony is nothing more than a very minor extension of Traditional Harmony. YES – There are some differences between Jazz Harmony and Traditional Harmony. However, they are very minor yet still seem to be a point of contention. Jazz Uses “Enharmonic” Chords – Example: There is no G7-5 or G7+5 in the Ab Melodic Minor scale. However, enharmonically there are – so in Jazz we’ll play the Ab Melodic Minor scales against either the G7-5 or G7+5 chords (as well as a standard G7). Jazz Rhythm is not “strict” – Yep, that’s true. Example: Eighth notes are not played straight they are “swung”. You’ll see books trying to explain eighth notes either as a form of triplet or using a 12/8 time signature. Both are close approximations to explain swing – however swing is something that needs to be learned by doing (not reading). Kinda like trying to learn to drive a car by reading a book. Silent movies were accompanied by improvised piano – so no, improvisation is not a recent Jazz thing. Chord Voicings – This can be confusing because some chord voicings have omitted notes that “seem” to be needed. 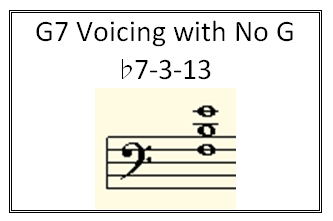 Example: There is no “G” in this common left handed G7 chord voicing of F + B + E – Traditional Harmony and science explains a great deal of how to voice chords, however Jazz adds an enharmonic element (see above). This will make more sense in future postings. Chord Substitution – Similar to the confusion on Chord Voicing (see previous), Traditional Harmony and science explains a great deal of how to substitute chords, however Jazz adds an enharmonic element (see above). This will make more sense in future postings. Which scale goes with which chord? – Similar to the confusion on Chord Voicing & Substitution (see previous), Traditional Harmony and science explains a great deal of which scale goes with chord, however Jazz adds an enharmonic element (see above). This will make more sense in future postings. Modal Harmony is complicated – Yes it is, and shouldn’t be. Modal harmony began in ancient Greek, who did not call them “modes” nor yet have any types of “scales”. The Greeks had groupings of four “harmonious” tones with local geographic inspired names (i.e. Dorian, Lydian Phrygian). Two pairs of four-tones created eight-note scales, which still retained their modal names. Early Catholic Church “chant” music was written using these scales still with modal names. Many years later those modes were distilled into the two Major and Minor scales we use today. Today, you’re welcome to memorize various names for the modes – however, the names and theory have little to do with today’s music. Just learn to play scales starting from any note, and leave memorizing modal names to Jeopardy contestants. I’ll never be able to play Giant Steps, Take Five etc. – Not with that attitude! 🙂 There will always (repeat always) be music and musicians beyond your technical capabilities. Great music and musicians should inspire and challange, not frustrate you. Find the style of music you love and simply find easier pieces to master. However, if you wish to improve there’s sincerely no substitute for practice. I’ll be tackling each of these topics; along with other supplemental lessons to support musicians and students needing the proper tools to understand Jazz Harmony and successfully improvise. Let the lessons (and your questions) begin! While not as cool as “Bing Automatic”, Microsoft’s Bing Desktop delivers the beauty of the Bing homepage to your Windows desktop each day. Plus, get easy access to the Bing search box right from your desktop. Turn your searching into doing with Bing. Microsoft has released their Windows 8 Consumer Preview – It’s Windows reimagined and reinvented from a solid core of Windows 7 speed and reliability. It’s an all-new touch interface. It’s a new Windows for new devices. Calendar Checking Tool for Outlook is a command-line program that checks Outlook Calendars for problems. To use this tool, the Outlook calendar must reside on a Microsoft Exchange Server. The tool does not work with IMAP, with POP3, or with other non-Exchange mail servers. Excel Cloud Data Analytics is a Microsoft Excel add-in that enables users to execute a variety of data-centric tasks on Windows Azure through a custom Ribbon in Excel. This add-in can be used to connect to data stored in the Windows Azure cloud and can be extended to connect to a variety of other data sources. It also provides a general framework in which the user can create data-analytics methods and run them in Windows Azure. The current code base supports the execution in Windows Azure via built-in access to Daytona, an iterative MapReduce runtime for Windows Azure. Using Excel Cloud Data Analytics, users can upload data to Windows Azure, select and run registered data-analysis algorithms in the cloud through Windows Azure, monitor the execution of the data analysis, and retrieve results for display or further processing. While I wish my 80 year old Father-in-Law would ask me for technical assistance, he’s proudly independent and still prefers doing things himself. He was tired of his old (analog) TV, and wanted to purchase a 40″ HDTV – should be no problem, and inexpensive for a senior with a fixed budget. So what did BestBuy recommend, and ultimately coerce him into purchasing? Really BestBuy? You should be ashamed … we cancelled the order for him, and will pick-out a nice TV anywhere except for BestBuy!